Another beauty from Jane Thornley! "A ruana by definition is a South America design often constructed as one long rectangle with two pieces extending over the shoulders and down the front on either side of the head. 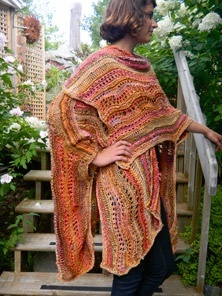 "Mine, however, wanted to be more generous, a suitably cozy cloak that could keep me toasty on crisp morns. And so it went. I knit a back with an ornamental free-range short-row yoke and found I had so much knitted fabric that I could create makeshift sleeves. 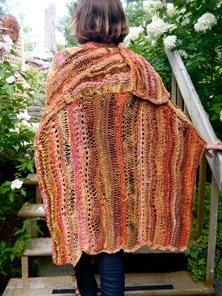 The fronts also gave me enough latitude to toss one side over my shoulder, let them hang free, or even pin one side cross-wise across my body, poncho style. "Not quite a ruana, then, put not a wrap, either-- a Wrapuana! "The fronts are two long drapes of stitchery, primarily drop and garter, long enough to wrap across the front to fasten with a pin or button or tossed over one shoulder. "The back is simply a long, fat, rectangle with a slightly wavy bottom, thanks to liberal doses of wave and feather&fan stitchery which undulate edges by nature. 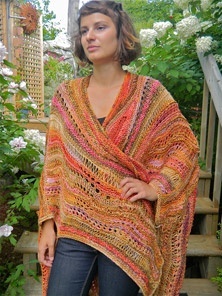 An upper yoke worked in a combination of short rows and mixed stitches creates a rear focal interest. 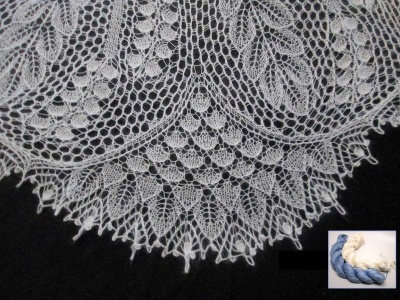 "Nothing is meant to be regular – the wave stitches cause hem undulations as does the yoke’s silky fall of drop stitches. I preferred the random drape, reminiscent of how the cloaks of old fell about the calves. Personally, that image conjures up visions of Colin Firth’s calves in a period film but that’s just me. Depending on your build, choose to scale yours to suit your height." What a marvelous design to play with! What we offer here is the pattern printed out, on heavy paper, and slid into a plastic sheet protector. If you prefer a PDF file to download and print out yourself, go to Jane's site -- she has them there for you. 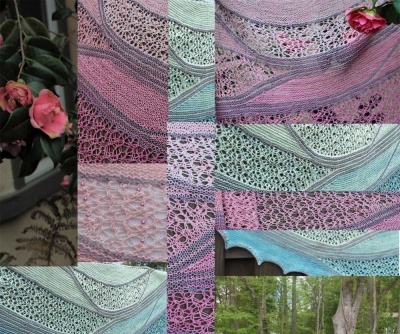 Jane's designs give you a wonderful opportunity to play with your knitting and use the gorgeous yarns you might have stashed away.